Fastenal (FAST) earnings preview: double-digit revenue growth? Fastenal Company (FAST) is expected to report earnings on July 11 before the market open. The report will be for the fiscal quarter ending June 2018. Shares are trading at 48.13, down -1.27% from yesterday. What are the FAST earnings expectations? What news will the market be watching out for? Since opening its first fasteners store in 1967, Fastenal has built one of the largest industrial distribution businesses in the United States. For many years, Fastenal’s growth story was driven by its store count, which now stands at approximately 2,400. While this expansive footprint is still an important component of Fastenal’s business model, other strategies--including expanding its product portfolio, its vending and inventory management services, and most recently, its on-site program--have become increasingly important growth drivers. The company disclosed that its 70,000-plus vending machines generate sales of $900 million today, but the long-term market opportunity is $22 billion. While vending products tend to carry a lower gross margin, approximately 20% of vending sales are higher-margin Fastenal-branded products. Fastenal could face gross margin headwinds as nonfastener sales, national accounts, and on-site programs become a larger part of the firm’s business. Amazon Business could disrupt the industrial distribution industry, taking market share and pressuring margins. 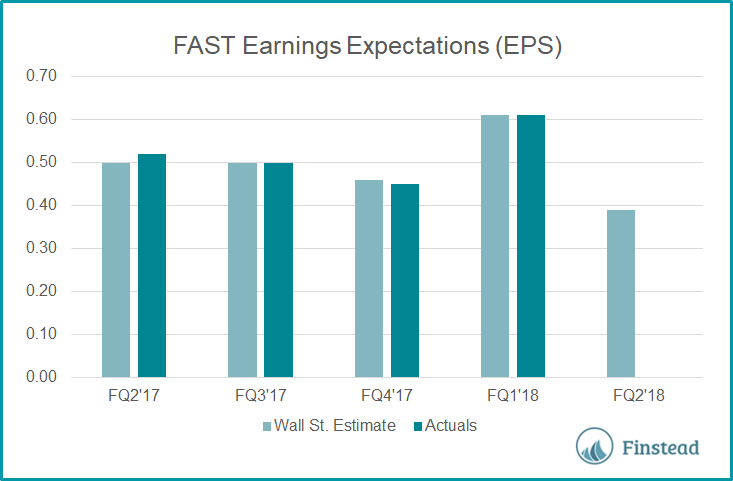 For FQ2’18, EPS is expected to grow by 27% year-over-year to $.66, while revenue is expected to grow 12% year-over-year to $1.27 billion. 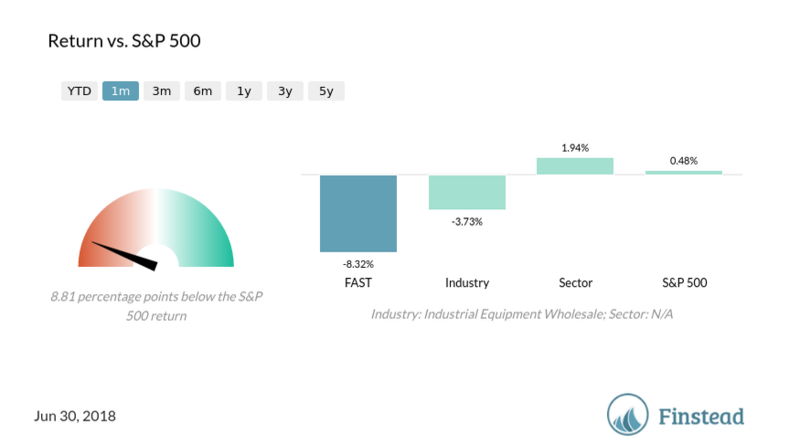 Over the last month, Fastenal Company (FAST) returned -8.32%. Fastenal Company (FAST) short share of float is 10.17%. The stock is much more frequently shorted than the average industry, sector or S&P 500 stock. Fastenal Company (FAST) average analyst price target ($55.57) is 15.46% above its current price ($48.13). For the latest price and information on Fastenal Company, please visit Finstead and search for "FAST price" or "FAST news". Disclaimer: The news article above expresses the author’s opinion about the topic of the article. We strongly advise you not to base your investment decisions just on this article alone. If you’d like to become a writer for Finstead Bites, please send us an email at hi@finstead.com. Are you looking for the analysis of Fastenal Company (FAST) stock? Are you wondering what the bulls and the bears say about it? If so, you came to the right place. In this stock guide, we will share with you 6 reasons to buy and 9 reasons to sell FAST stock. You’ll get a perspective on what the bulls and the bears say about it. Is FAST a buy or a sell? Should I sell or hold FAST stock today? Is FAST a good buy / investment? What are FAST analyst opinions, recommendations and ratings? 1. Vending and on-site programs should provide a long growth runway for Fastenal. The company believes the market could support 1.7 million vending machines and 15,000 on-site locations. 2. Fastenal can capitalize on its national scale, broad product portfolio, and inventory-management services to take market share from smaller and less-capable distributors. 3. 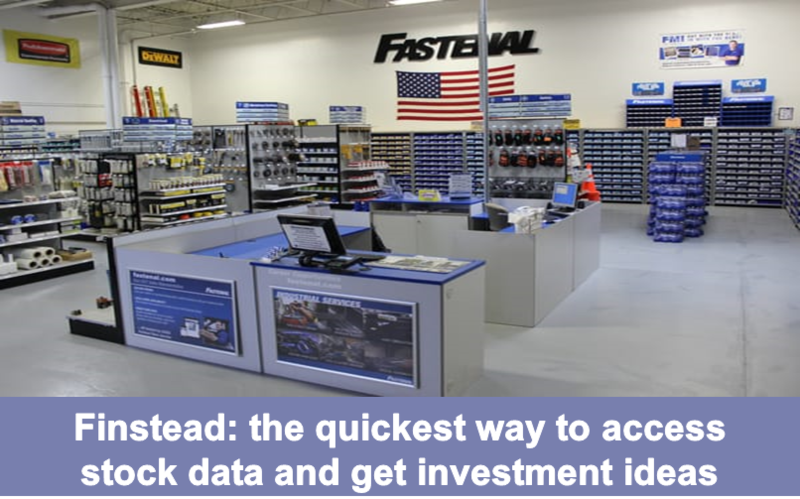 Despite serving cyclical end markets, Fastenal’s business model generates strong free cash flow throughout the cycle. Fastenal will likely continue to use its cash flow to fund a shareholder-friendly capital allocation strategy. 4. FAST quarterly revenue growth was 13.10%, higher than the industry and sector average revenue growth (7.92% and 4.74%, respectively). See FAST revenue growth chart. 5. FAST profitability is improving. The YoY profit margin change was 0.57pp. See FAST profitability chart. 6. FAST forward dividend yield is 2.67%, higher than the industry (0.50%) and sector (0.45%) forward dividend yields. See FAST forward dividend chart. 1. Fastenal could face gross margin headwinds as nonfastener sales, national accounts, and on-site programs become a larger part of the firm’s business. A continued mix shift toward nonfasteners also could dilute the firm’s differentiation. 2. Amazon Business could disrupt the industrial distribution industry, taking market share and pressuring margins. 3. Once a primary growth driver, store count has declined by 8% since its 2013 peak as market saturation and e-commerce make new stores a less-viable growth strategy. 4. FAST stock price ($68.48) is close to the 52-week high ($68.58). Perhaps now is a good time to sell? See FAST price chart. 5. FAST forward P/E ratio is 21.50, and it’s high compared to its industry peers’ P/E ratios. See FAST forward P/E ratio chart. 6. FAST Price/Sales ratio is 3.79, and it’s high compared to its industry peers’ P/S ratios. See FAST forward Price/Sales ratio chart. 7. FAST average analyst price target ($60.14) is below its current price ($68.48). See FAST price target chart. 8. FAST short share of float is 8.96%. The stock is much more frequently shorted than the average industry, sector or S&P 500 stock. See FAST short share of float chart. 9. FAST short interest (days to cover the shorts) ratio is 12.08. The stock garners more short interest than the average industry, sector or S&P 500 stock. See FAST short interest ratio chart. What are your thoughts on FAST?